H.H. The Aga Khan is to be awarded one of the the highest India Awards by the President of India on the Republic Day of India this year, . The awards are announced on the occasion of Republic Day every year. These awards are conferred by the President of India at ceremonial functions which are held at Rashtrapati Bhawan usually around March/ April every year. 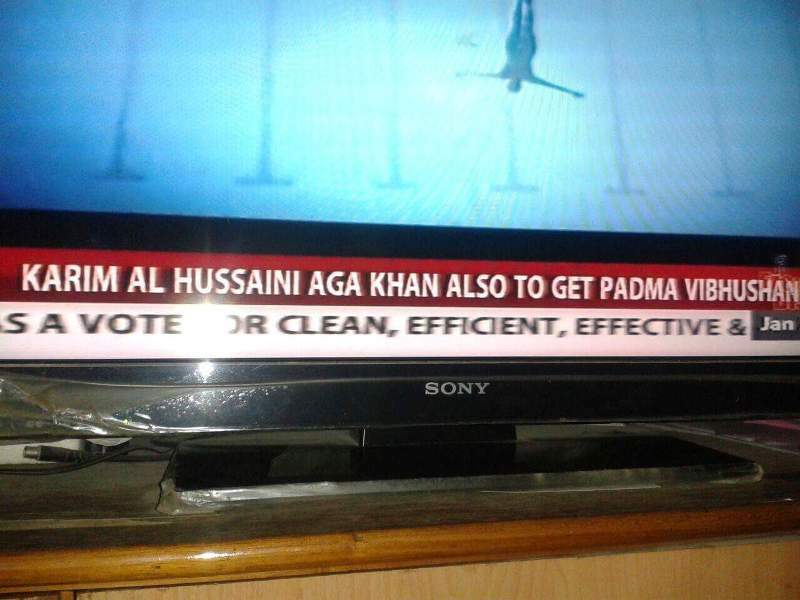 He has received the Padma Vibhushan in the ‘trade and industry’ category, but it is his moderate views that are of special appeal to the NDA government.He has received the Padma Vibhushan in the ‘trade and industry’ category, but it is his moderate views that are of special appeal to the NDA government. NEW DELHI: The Padma Awards list has many hidden signals in its enumeration, some are politically pertaining to Prime Minister Narendra Modi's career. The inclusion of Punjab Chief Minister Parkash Singh Badal and Karim Aga Khan, the head of the Nizari Ismaili sect in the Padma Vibhushan list is significant in this regard. While it is true that the Aga Khan is known for his moderate view and India has a significant population of Ismailis, his relationship with Modi dates further to the time of Gujarat riots. According to top sources in the government, disturbed by reports of riots in Gujarat and having received distress signals from his followers in the state, Khan got in touch with then deputy chairperson of the Rajya Sabha Najma Heptullah in order to secure his people. Heptullah, now Minority Affairs Minister in the Modi government, was still in the Congress but had excellent relations with BJP. She called up Home Minister LK Advani to convey his concerns on the matter. "Within a few hours, Modiji called up Najmaji who told him the particulars of the situation. He promised to look into the matter, and did in fact ensure that they were safe. He called Najmaji back to tell her of the same," said a source. Since then, Khan and Modi have had contact and a good relationship. He has received the Padma Vibhushan in the 'trade and industry' category, but it is his moderate views that are of special appeal to the NDA government. According to top BJP sources, the inclusion of Badal, coupled with the fact that BJP has let four assembly seats go to the Shiromani Akali Dal in Delhi, compared to three in the past, meant that some healing was taking place in the breach between the two parties. "BJP president Amit Shah too cancelled his proposed rally in Amritsar," said a source. Bharatiya Janata Party had taken an aggressive stance towards the SAD government in Punjab on the issue of drug smuggling after Prime Minister Narendra Modi flagged the issue in his monthly radio broadcast Mann ki Baat. Instituted in 1954, the Padma Awards recognise individual achievements in a wide range of disciplines. Furthermore, a recipient’s demonstrated excellence must be complemented by a commitment to public service in their field of achievement. The Padma Awards comprise three levels of recognition: Padma Shri is awarded for distinguished service; Padma Bhushan is for distinguished service of a high order; and Padma Vibhushan recognises exceptional and distinguished service. 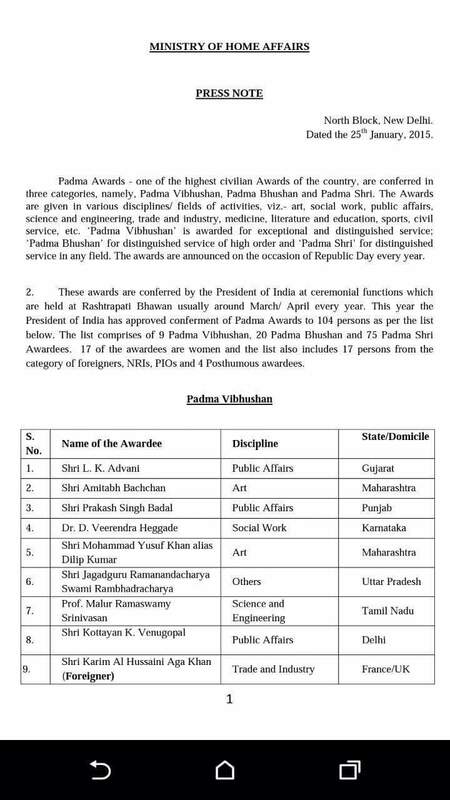 The Government of India has named 104 recipients of Padma awards this year. The Ismailis has a long and historic relationship with India, and continues to work in close partnership with the government and people of the country through the institutions of the Aga Khan Development Network. The work of the AKDN in India goes back over a 100 years to 1905, when the first Aga Khan School was established in Mundra, Gujarat. Today, there are Aga Khan schools across the country, including the Aga Khan Academy, Hyderabad — the second in a network of International Baccalaureate schools being established across Asia and Africa that aim to develop home grown leadership. The Urban Renewal Initiative in Delhi is a landmark AKDN project that unifies three historical sites — Humayun’s Tomb, Nizamuddin Basti and Sunder Nursery — into one unique heritage precinct. Another iconic project is the Aga Khan Rural Support Programme, which was established in 1984. To date it has reached over 500,000 beneficiaries in over 1,100 villages in Gujarat, Madhya Pradesh and Bihar. Sixteen others from other countries, including a few of Indian origin, are among 104 people chosen for the Padma awards. ates - all from the US - and Saichiro Misumi from Japan will receive the Padma Bhushan. Jean-Claude Carriere and Jacques Blamont (France), Huang Baosheng (China), Nandrajan 'Raj' Chetty, George L. Hart, Tripti Mukherjee, Dattatreyudu Nori, Raghu Rama Pillarisetti (all from the US), Jagat Guru Amrta Suryananda Maha Raja (Portugal), Saumitra Rawat (Britain) and Annette Schmiedchen (Germany) were named for the Padma Shri, a government statement said Sunday. Others receiving awards include BJP leader L.K. Advani, actors Dilip Kumar and Amitabh Bachchan and Punjab Chief Minister Parkash Singh Badal.